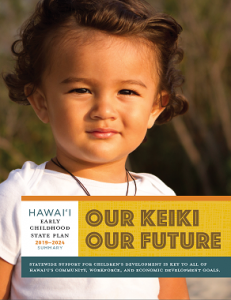 A section from “Our Keiki, Our Future,” the Hawai’i early childhood state plan. The governor is joining with community leaders to implement the early childhood state plan. What if every keiki in Hawai‘i could have a healthy start, a safe haven of family support, and a positive place to learn? Think of the impact on reducing crime and substance abuse. Imagine the benefits for community growth. Gov. 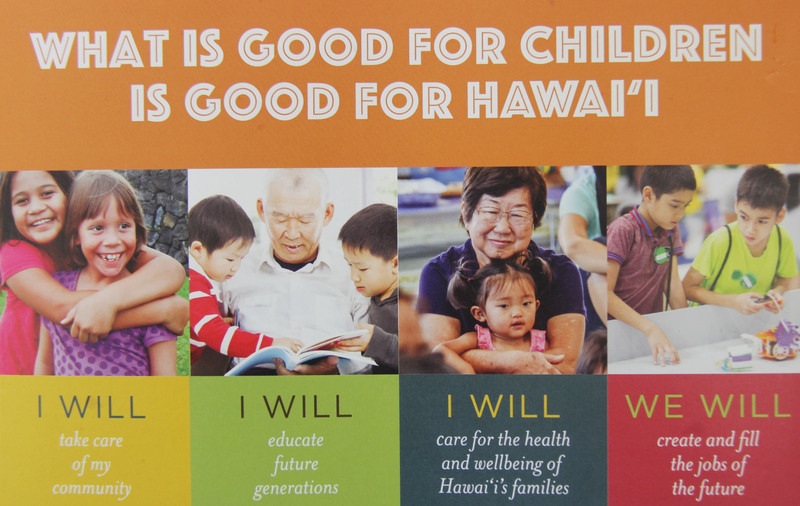 David Ige and state leaders believe the answers lie in the first-ever Hawai‘i Early Childhood State Plan 2019-2024, a collaborative roadmap to guide public and private efforts now and in the future. The five-year plan sets the foundation for statewide efforts for children, pre-natal through age 8, in children’s health, safety and well-being, family resources and early care and learning. “All children in Hawai‘i should have the best possible foundation for a successful life,” said the governor. “This plan includes strategies and priorities that provide inspiration and structure to our efforts over the next several years.” The state also has been awarded a $1 million federal grant to help with the next level of implementation. The Executive Office on Early Learning (EOEL) and its board will work with stakeholders statewide to move the plan forward. The five-year plan, developed by a broad spectrum of representatives from public and private sectors, covers five building blocks to address the needs of children, families and the workforce. These include child and family health, safety and wellbeing; family partnerships and support; foundations for early learning; a well-prepared, well-supported early childhood workforce; and a coordinated early childhood system. DOE Superintendent Christina Kishimoto emphasized the importance of early learning in a Honolulu Star-Advertiser interview. “There is very long-term research that says pre-K access matters in closing the achievement gap (between students from low-income families and students from higher-income families). We have a huge achievement gap in this state,” she said. As a first step, the governor and the DOE are proposing converting up to 22 classrooms into pre-K facilities at elementary schools statewide, where there is already demand and space available. “Ultimately, we will need more than 300 public pre-K classrooms. Clearly, this is a long-term goal. 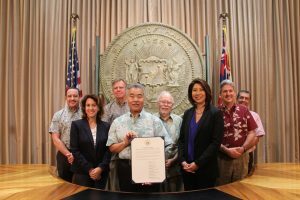 But we don’t have to wait until we have funding for all of it,” said Governor Ige. In the future, the DOE plans to identify schools that are interested in moving their 6th grade to the intermediate level to make room for a pre-K program. To meet the increased demand for qualified pre-K teachers, EOEL director Moriguchi said her office offers an Early Learning Academy and supports DOE and UH efforts to recruit and certify more early childhood educators. Currently, the EOEL office has 26 pre-K classrooms operating in DOE schools on several islands with programs available free of charge to 4-year-olds who qualify based on family income. Applications for the 2019-2020 school year are available from http://earlylearning.hawaii.gov/. Visit this website to see the full Early Childhood State Plan and learn how to get involved.